CRE : class, i want u to vote for our senior pages, whether it would be all black and white or all colour pages. CRE : soo this is the result, 16 votes for all colour pages, 12 votes for 2 black and white and 2 colour pages, 2 votes for black and white and satu undi rosak. SPM is just around the corner but yet i can still be online during midnight or anytime i want. Maybe because the computer had been switched on almost the whole day and only rest to sleep after 3 a.m.
Why ohhh why am i not scared of it? In spring 2008, a different kind of European art exhibit was unveiled for the launch of BBC’s on-demand TV service. For the event, they asked artist Prudence Emma Staite, founder of FoodIsArt.co.uk, to depict legendary British TV characters or shows in “paintings” made of food. 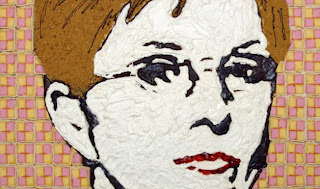 Above is a portrait of Anne Robinson, most famous for her role as the host of The Weakest Link , crafted from cake and biscuits. The structure above, created in 2005 by Platt Byard Dovell White Architects LLP, is made from 5,000 cans of sliced bamboo shoots and stuffed vine leaves. It’s one of several works to come out of Canstruction—a trademark charity event and design/build competition under the auspices of the Society for Design Administration. The challenge? 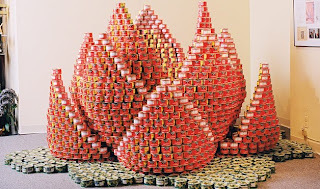 To build large structures made of unopened food cans, which are later donated to city-registered food banks. 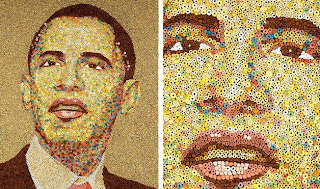 This mosaic of President Barack Obama, created by Hank Willis Thomas and Ryan Alexiev of CerealArt.com, showcases a slew of sugary cereals including Honeycomb, Life and Froot Loops. The company, which is inspired by 3D visual art and consumer culture, wanted to make a commentary about the president’s iconic and commercial appeal, much in line with Thomas’ other work, which typically deals with the complex issues of race, identity, class and history in the age of consumerism. 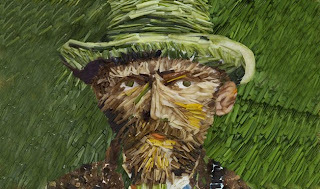 The above artwork, inspired by one of Vincent van Gogh’s many self-portraits, was displayed at the Paris-Beijing Photo Gallery from November 23, 2008 to January 22, 2009 as part of Chinese artist Ju Duoqi’s exhibit titled The Vegetable Museum. In the series, Duoqi recreates Western masterpieces using common Chinese cuisine ingredients—including tofu, cabbage, ginger, lotus roots, coriander and sweet potato—then photographs them for gallery and museum showings. Created by London-based photographer Carl Warner, this food-scape is one of many images in a series that features foodie creations, such as pea pod boats, strawberry hot air balloons, salmon seas and Parmesan cliffs. Once designed, the setting is photographed and touched up to create original photographic works of art. 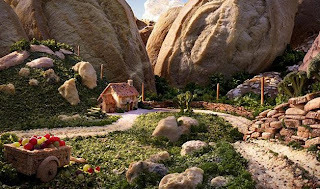 In the picture above, loaves of bread were used to depict mountains among a cove of sliced-bread cobblestones and cheese boulders. 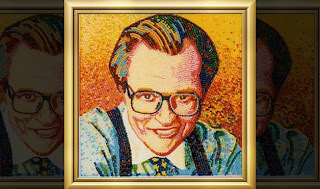 Displayed in The Jelly Belly Museum of Bean Art, the above mosaic of Larry King was created by Peter Rocha—who passed away in 2004. For each of his mosaics, Rocha placed the candy pieces on a layer of varnish, allowed it to dry and then covered the beans with more varnish—thus preventing bugs from appreciating his masterwork in a more literal way. This particular portrait uses around 10,000 jelly beans in a variety of flavors, including blueberry, which was used for the suspenders. This candy-filled creation, replicating one of Andy Warhol’s most famous silkscreen paintings, is made with a sugar-coated chocolate candy that is primarily sold throughout Europe and the United Kingdom. The work, created by photo artist Prudence Emma Staite of FoodIsArt.co.uk, was part of the Smartie Art Exhibition at the V&A Museum of Childhood in London. 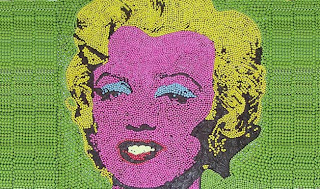 The exhibit marked the relaunch of the blue Smartie, which was used for Monroe’s eyeshadow in this work of art. 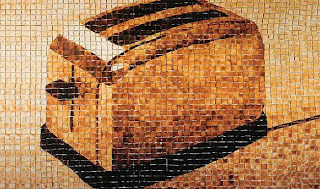 This 14.5 x 16.5-inch mosaic by Ingrid Falk and Gustavo Aguerre was made entirely of toast—specifically, 3,053 slices with varying degrees of toastedness, including shades of white, beige, tan, ochre, rust and black. The two artists are known for using bread and food as a recurring theme in their artwork. This piece, which took several days of toasting—and the use of multiple friends’ toasters—to complete, was displayed at the Galleria Milano in Milan, Italy, in October and November 1999. Since 1989, food artist Jean Zaun has been crafting paintings composed entirely of chocolate, food color, edible gold sugars and confectionery glaze. 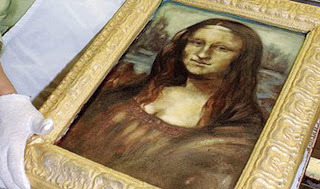 Above is his rendition of Leonardo da Vinci’s famous portrait, which is painted on a white chocolate “canvas” base, bordered with a dark chocolate frame and finished with a confectionery glaze. 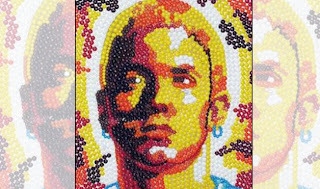 Crafted out of more than 1,000 M&M’s, including rare pale blue and white varieties, this 40 x 30-inch portrait of the Detroit rapper weighs in at eight pounds and was made by candy artist Enrique Ramos. The photo, bought by Ripley’s Believe It or Not!, is now on display at their Gallery of Unusual Art in Gatlinburg, Tennessee—hanging amongst a befitting collection of artwork that includes a portrait of Princess Diana made of lint and a portrait of Michael Jackson rendered in gumballs. Ishhh..bile nak study nih. Every weekend jer ada 5-6 open houses. Dahtuh makan banyak. Suka tak suka kene baca jugak. I think that my keblurran telah berkurang. WHoaa. I realised it today. HaHa. Saya tak suka bila saya lalu depan orang sedang merokok or mereka lalu depan saya kerana bau rokok itu sangat memeningkan dan semestinya tak wangi. Saya lagi tak suka bila tiap kali jumpa atau cakap nak beremo jer walaupun saya suka mendengar luahan hati orang lain. Saya lagilaa tak suka bila semuanya nak ikut kehendak suke hati dia jer.Ingat dia sape laa sangat. Saya sangat tak suka bila melihat kerajaan mementingkan diri sendiri dan manusia2 yang berpangkat dalam bidang politik pakai baju mahal2 guna duit kerajaan. Saya rasa benci bila tengok org lain atau saye sendiri kene tindas. Oleh sebab itu saya cepat marah. Saya bengang bila orang carik pasal dengan saya kerana saya kurang kesabaran bergantung kepada situasi. Saya ingin tahu kenapa kite orang kene tunduk kepada Sultan dan mendaulatkannya kerana bagi saya mereka hanya manusia biase jer. Saya tergamam bila orang bercakap tentang body figure seseorang atau saya sendiri depan orang lain atau saya sendiri kerana bagi saya mereka tak respect orang lain. Saya berharap agar maid saya skrang nih jangan mengade lelebih sebelum saya marah dia teruk2.ish3. Saya lagi berharap supaya saya dapat master debate in english dengan lebih cemerlang walaupun rase macam impossible melihatkan kepada english saya yang semakin teruk. Saya suka bila saya on handphone tiap2 pagi ade orang hantar 'Good Morning!!!!' or 'Have a wonderful day' or ape2 yang menarik cuz it really makes my day. Saya suka bila kawan2 bukan Islam senyum dan saling bertegur dengan saya kerana saya paling menyampah dengan racist. Saya teringin nak blanje my family and friends shopping kalo duit saya banyak. Saya rase sampai nih jer kot.Nanti tambah lagi. Macam pelik plak ber-saya saya. Suatu hari itu, kedengaran suara keriangan anak anak kecil berlari lari kecil di sekitar rumah. Suatu hari itu, kelihatan anak anak kecil bermain bunga api di tepian jalan. Suatu hari itu, wan, atuk, pakcik, makcik, maklang, paklang, mak ucu, ucu, paklong, umi, mama dan papa bersama sama dengan sanak saudara duduk bersila di atas tikar mengkuang sambil menunggu azan berkumandang. Tiada lagi celoteh wan, atuk saudara mara sambil menganyam ketupat. Sambil mengisi beras dalam ketupat. Sambil merebus ketupat. Sambil memasak. Dulu, tiap kali melawat wan dan atuk, sambal goreng kegemaranku susah tersedia di meja. Sambal sotong kering kegemaranku sudah siap dimasak. Tinggal makan je. Sekarang lain. Semenjak pemergian arwah wan dan atuk, suasana sangat berbeza. Tiap kali pagi raya, aku terbayangkan suasana malam raya beberapa tahun dahulu. Suasana di pagi raya. "bila kita mau balik kampung"
Takda kampung macam mane nak balik dik. Maka, hargailah setiap detik masa yang anda luangkan bersama keluarga. Nih tiap kali datang je, internet on. Tiga, empat komputer beratur atas meja. Mulut ikut sedap hati je cakap. Anak anak muda zaman sekarang.